Visitors can be forgiven for overlooking the La Sals, even as the towering peaks loom over so many Moab experiences, providing a snow-capped backdrop for iconic images of the Slickrock Trail or Delicate Arch. After all, from down in the desert they're almost like a mirage, hanging over the canyons and buttes people traverse the globe to see. However, I may not be forgiven for breaking local protocol and sharing the news that for many Moabites the barely tolerable midsummer heat is their favorite aspect of Moab's climate—because it means the La Sal Mountains are at their most inviting. There are some obvious user groups who look forward to the snow melting off the La Sals. Since this is Moab, cyclists are high on that list. For road riders, the La Sal Loop Road is a little slice of the Pyrenees, the mountains which crush the peloton every year in the Tour de France. More than one roadie has been heard to quip that without the Loop Road, life in Moab would be intolerable. Grandiose moniker aside, the Loop Road barely laps at the shores of this island in the desert, and it doesn't circumnavigate the range as the name seems to suggest. Mountain bikers can get a better sense of the scale of the La Sals on the Whole Enchilada, a shuttled ride (for all but the stoutest riders) that descends more than 40 miles from over 11,000 feet down to the Colorado River 7,000 feet below. While those experiences, or even a simple driving tour, afford the wonderful juxtaposition of viewing the blazing, red desert from the cool, verdant mountains, they don't reveal the same aspect of the mountains' character as a day—or more—with your feet on the ground. The fact that even at 24 million years old the La Sals are one of the youngest mountain ranges in the country should suggest a slower pace. The La Sals are a laccolithic structure, which means they are a volcano which never burst, instead injecting lava into a space between existing layers of rock, forcing the top layer upward. Occurring on the relatively flat Colorado Plateau, this phenomenon creates some magnificent, showy peaks. The La Sal Mountains are a tiny range. Look at a map (or Google Earth) and compare the range to the massive Uintah Mountains upstate. 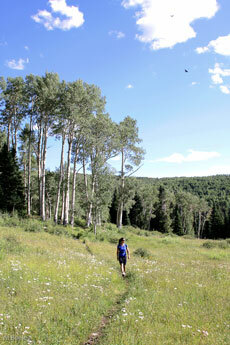 Now consider that while the Uintahs are home to Kings Peak, the highest in Utah, the diminutive La Sals are home to Mt. Peale, the third highest peak in the state, a numeric palindrome at 12,721. As an ultra-prominent peak, Peale attracts numerous peak-baggers every year. Its prominence status is calculated through a complicated equation which includes elevation gain from the foot of the mountains, visibility from other locations, and proximity to other large features, among other criteria. 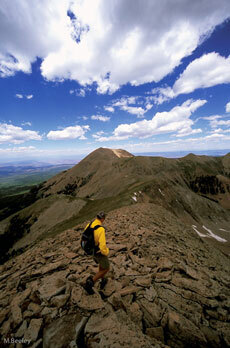 Peale ranks twenty-third among peaks in the continental United States, surpassing more famous peaks like Mt. Washington in New Hampshire and Pike's Peak in Colorado for visual assertiveness. You can reach Peale via La Sal Pass, which is accessed by graded dirt road, from just outside Old La Sal. The hike up the scree slope is unmarked, but the route is obvious. However, even at just a few miles it is relatively strenuous, especially for those unaccustomed to altitude. 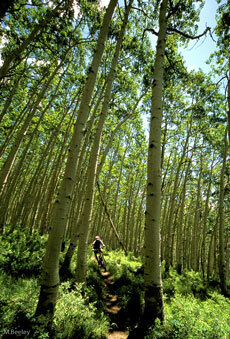 The most accessible, and most popular, areas of the La Sals are around Warner and Oowah Lakes. Both lakes are great bases for days of mountain leisure, whether from the well-developed and closely maintained campground at Warner Lake or from the more primitive facility at Oowah. The Warner Lake Campground is popular enough to require reservations many weekends, especially to rent the camping cabin, which is a refurbished guard station. Reservations can be made at www.reservations.gov. Starting at ground level, almost from the first spring opening of the roads up into the La Sals, the wildflowers are the first sign you're not in the desert anymore. Long after the desert display of flowering cacti has succumbed to the dry heat, the wild irises will pack every marsh, columbine will flare up in the dappled light of the pine forests, and sego lilies will belie their delicate features by popping up in the harsh scrublands of sage and gambel oak. The wildflower bloom occurs throughout the snow-free season in the La Sals, with the band of color moving slowing higher, until it hits the upper elevations later in the season. Prime viewing time for wildflower colors would be June and July. An even more colorful display comes on later, toward the end of September, when the golden glow of the aspens is highlighted by the deep red oak leaves with blazing effect, especially at sunset. If you need something to do with your hands while your eyes ingest all this color beneath towering peaks, bring a fishing rod, as the Division of Wildlife Resources stocks trout in most every pond (they're called lakes, but this is a stretch) in the La Sals. 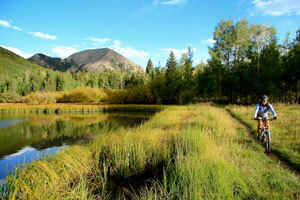 Oowah and Warner Lakes are by far the most popular fishing holes, and they are well-stocked with rainbow trout. Oowah also has a healthy, wild population of brook trout, mostly at the inlet end of the lake. Fishing access to Warner can be a little tough, as the dike which forms the lake is the only good spot to cast from. It's often filled with families pulling in fish after fish. The lake is a little shallow for float tubes, though small, non-motorized boats like canoes can be very helpful, especially for fly fishers—but launching requires a short portage from the campground, so small is key. Oowah Lake is accessible all the way around, though steep banks make back-casting tough for a fly rod. Like on Warner, fly fishers might prefer some type of craft, especially to access the brookies at the head of the lake; also like Warner, portage is required—there's no boat ramp. Oowah is plenty deep for float tubes. For an interesting surprise, you can take a longer drive out the Gateway Road from the north end of the Loop Road to Don's Lake, which is stocked with tiger trout, a hybrid of brook and brown trout—if you've not seen one, you might not recognize the dramatically striped fish as a trout. 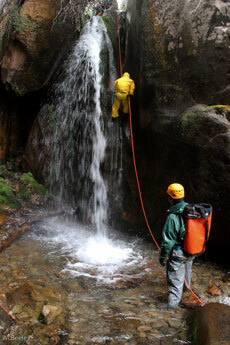 More intrepid anglers could drop into the ravine below the Loop Road Bridge over Mill Creek, just past the Oowah Lake turn, to stalk the legendary brown trout that supposedly lurk in the small drop pools of the steep canyon. The cars parked along the Loop Road usually belong to climbers, which speaks to the challenges of accessing and fishing this section. 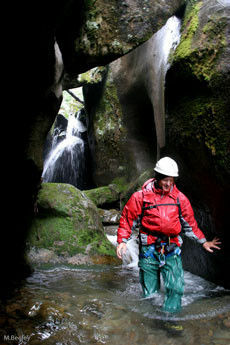 Mill Creek does drop into a deep canyon below the bridge, but above the bridge the creek's drainage, and the many smaller drainages which feed it, offer relatively easy access to the forest, with its abundant flora and fauna. The Burro Pass Trail, part of the mountain bikers' Whole Enchilada route, begins from Warner Lake with a fairly gentle grade for a couple of miles, offering a nice break from fishing the dike. The lakes can also make great base camps for numerous day hikes on the tangle of trails between them, Clark Lake, Burro Pass and Moonlight Meadows. Backpackers could connect the different sites over a number of days, whether enjoying the luxury of the developed and semi-developed camping, or camping in the backcountry, which is allowed throughout the La Sals. Except for the shuttle companies dropping cyclists off to ride all or part of the Whole Enchilada, the La Sals are commercially under-utilized by the local tourism industry. 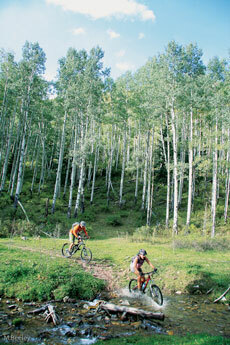 Summer is Moab's slow season for visitors, but it's when the La Sals are at their best. Since all the mountain ranges in the west are most accessible in summer, people don't flock to Moab for alpine adventure. 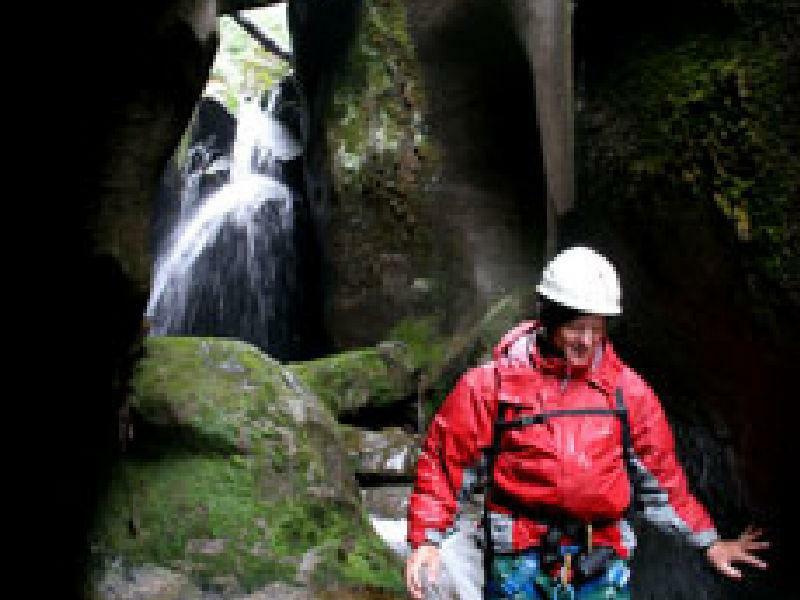 If you're looking for expert advice on advanced opportunities for biking or canyoneering in the La Sals, local outfitters are more than happy to comply. However, the best part about the La Sals in summer may be that they exist outside the usual bustle of the Moab tourist industry.